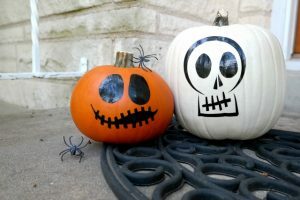 Many shy away from Halloween pumpkin decorations due to the hassle of carving pumpkins. The readymade decorated ones being pricey, you can opt for DIY no-carve pumpkins. 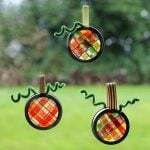 They are mostly easy to make and are mostly painted or crafted with colorful paper. 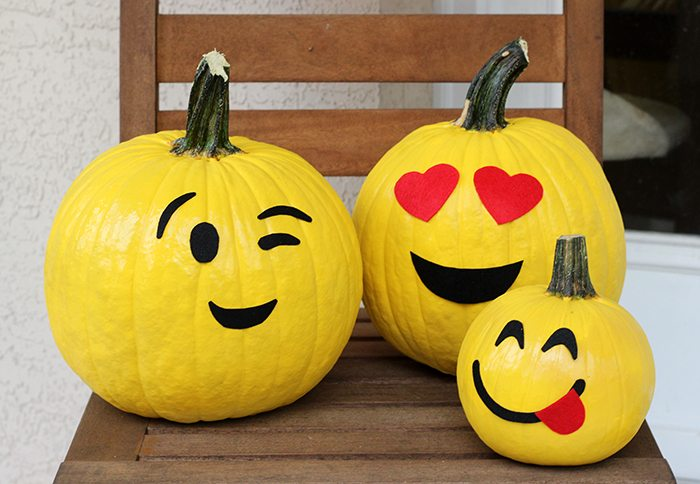 Emojis add a fun (read funny) element to your pumpkins. 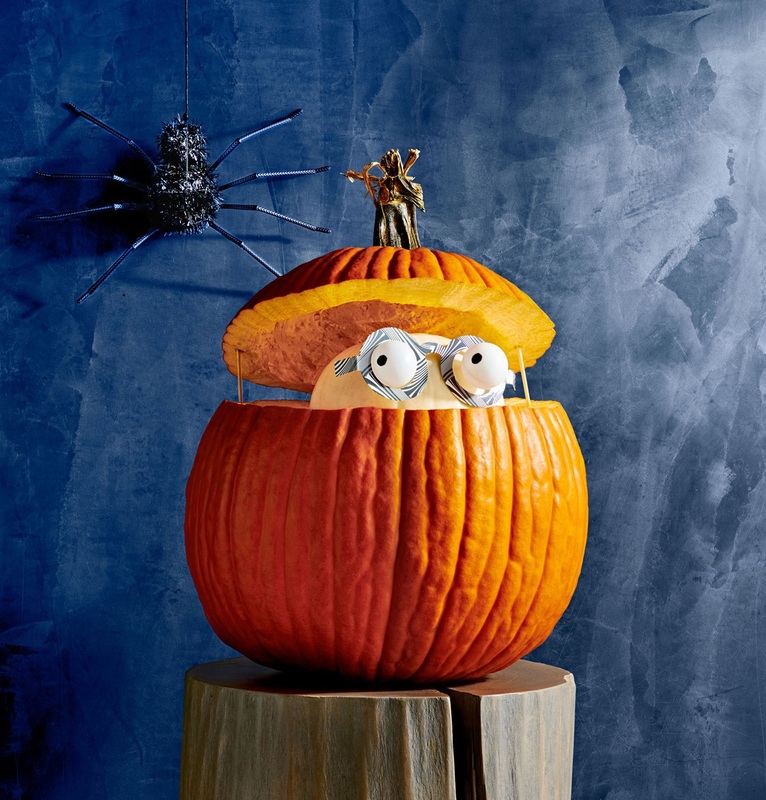 It also goes to show that you are keeping abreast with modern times. The above-linked tutorial provides you with the instructions for making 3 different types of no-carve pumpkins. 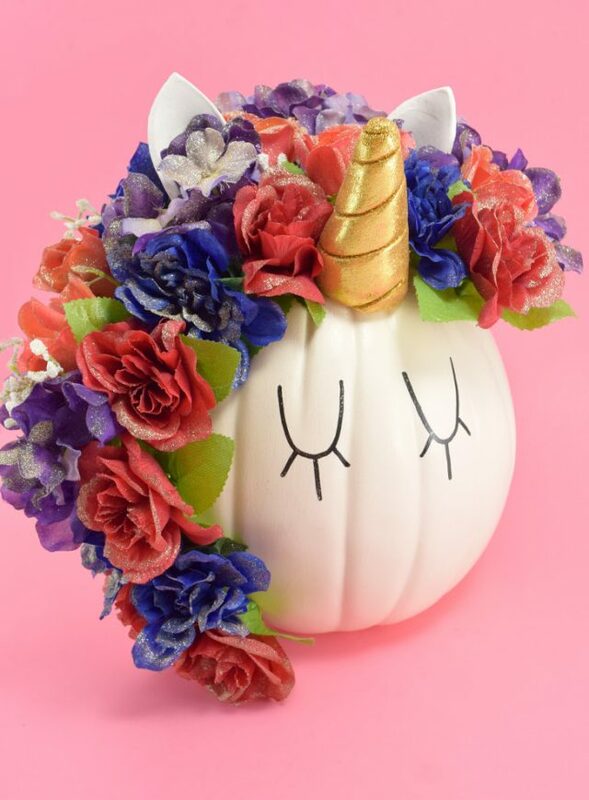 The first one uses decoupage, the 2nd one thumbtacks and the 3rd that sports a pretty feminine face is made of silk flowers and sketched with a marker pen. 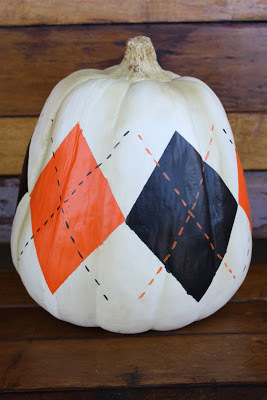 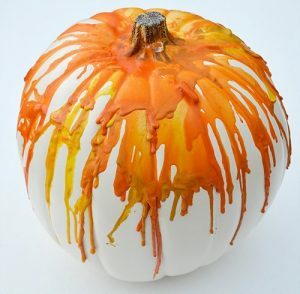 To make this unique decoration, first, paint a pumpkin white, then make diamond shapes on it with painter’s tape. 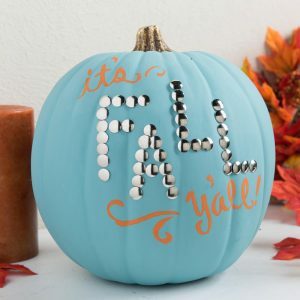 Next, paint them alternately in the colors indicated. Finally, take a fine-tipped paintbrush and make dotted X’s over the edges of the diamonds. 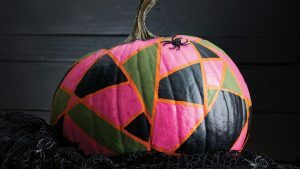 You’ll get the kids enthusiastic when you ask them to make this bubblegum machine-inspired pumpkin. 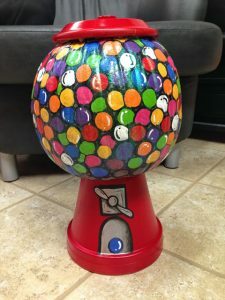 A terracotta flower pot makes the base of the structure. 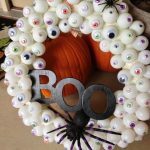 Give a spook element to your non carved pumpkins by wrapping them with white cloth revealing the googly eyes. 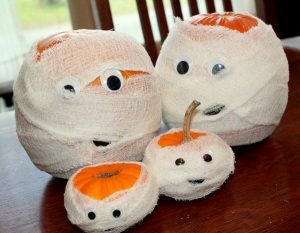 Needless to say, that they are made to resemble mummies. In this project, yellow and orange crayons are placed in a pattern encircling the stem of a pumpkin and a hairdryer is focused on them to melt them and make an eerie shape. Washi tape in gold, silver and black stripes attached along the creases of a pumpkin look awesome as a Halloween decoration that requires no carving. 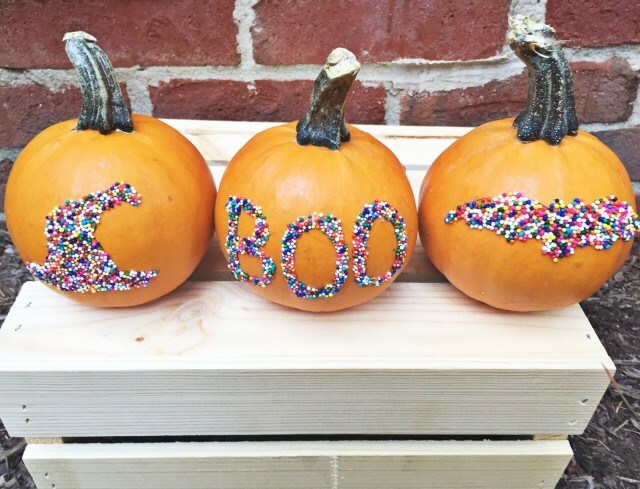 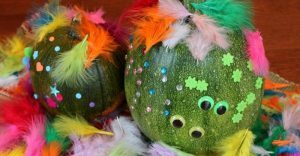 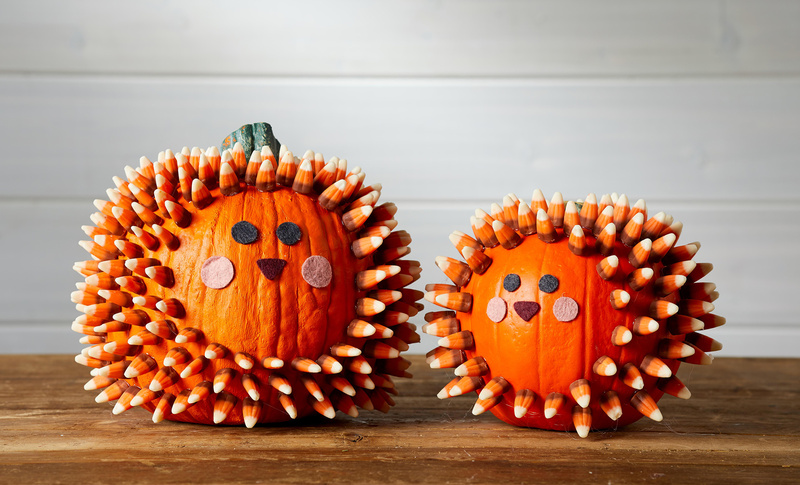 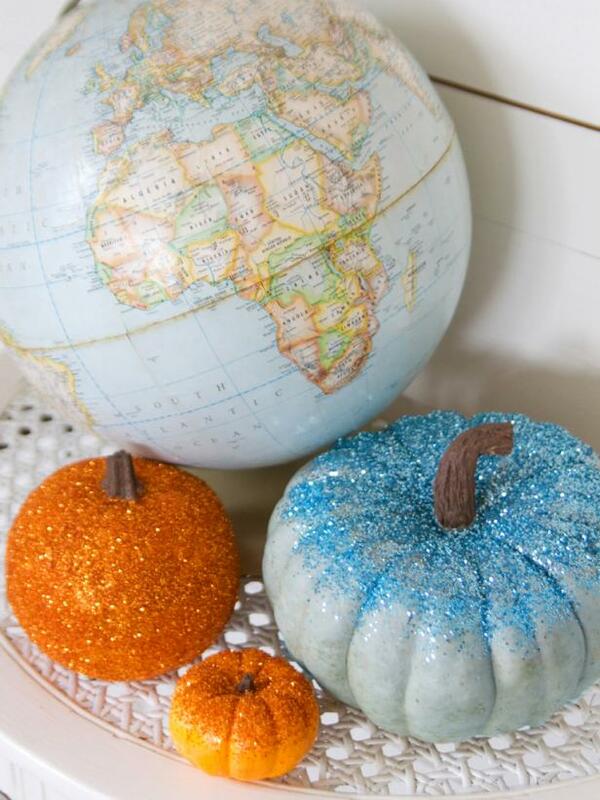 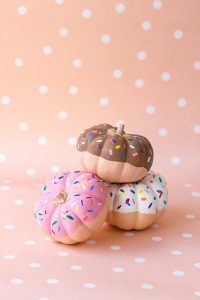 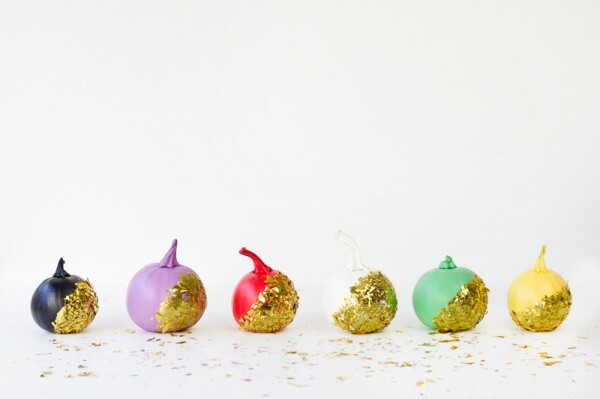 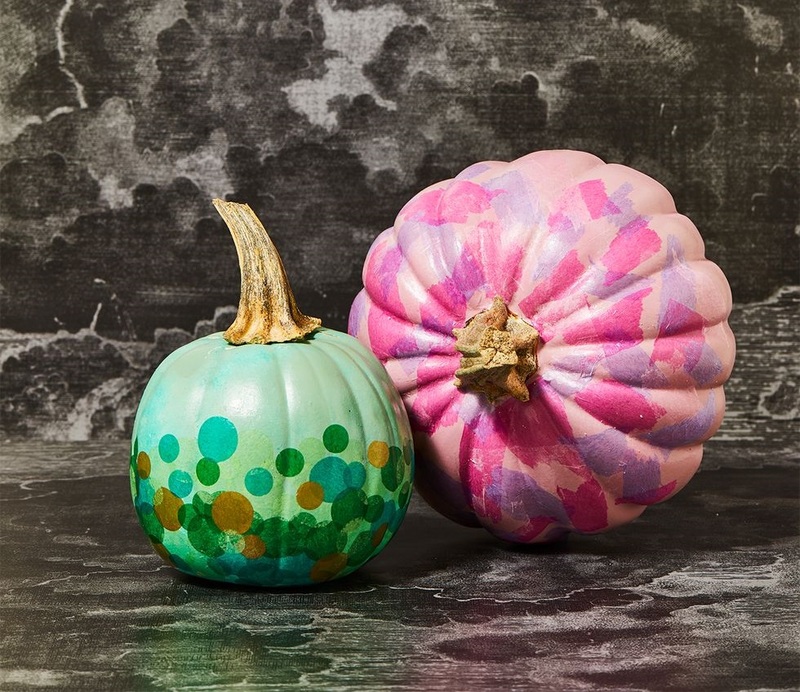 Gather glitter in colors of your choice to make these sparkly pumpkins. 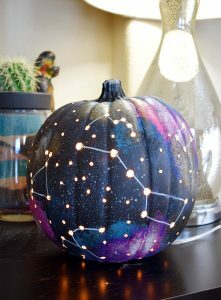 They would gorgeously light up the Halloween night. 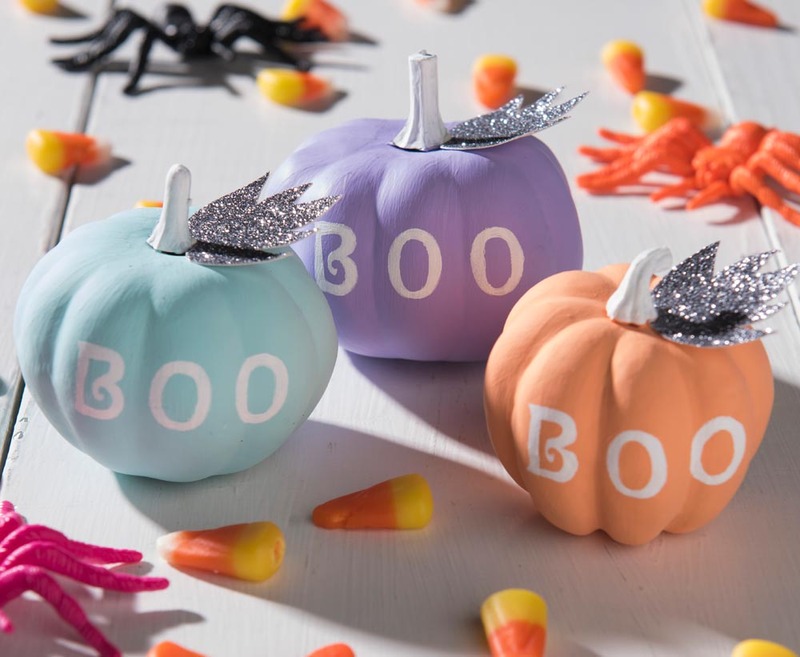 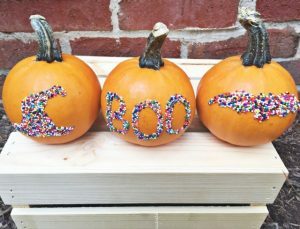 A nice way to decorate pumpkins is by writing BOO in bold fonts on them with pencil and filling them up by gluing buttons. 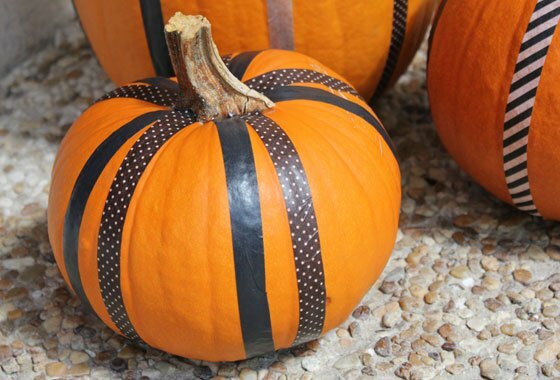 A polka dotted black bow wrapped around the stem adds to the looks. 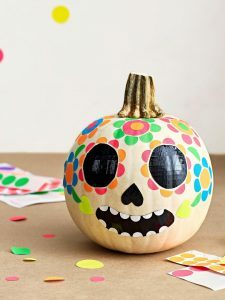 A sugar skull pumpkin looks both scary and cute at the same time. 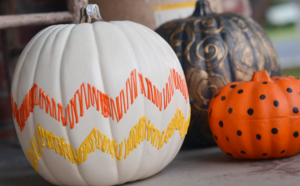 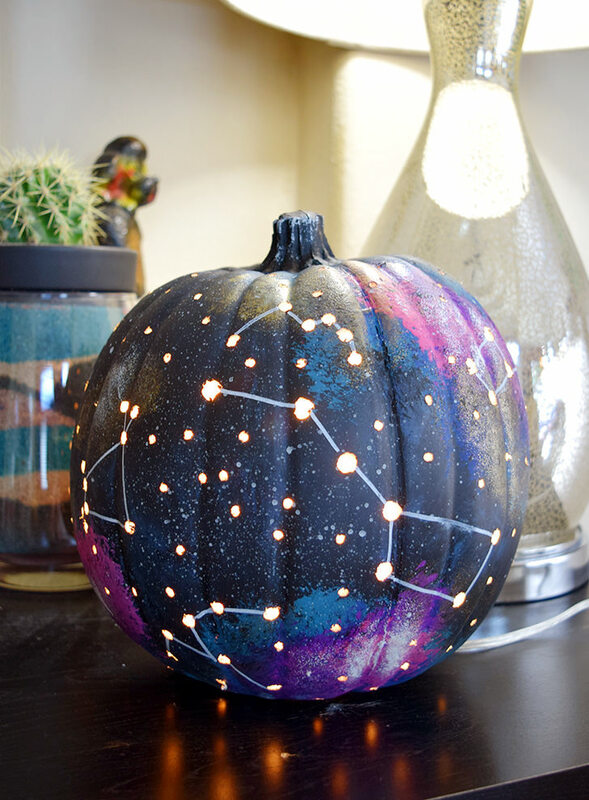 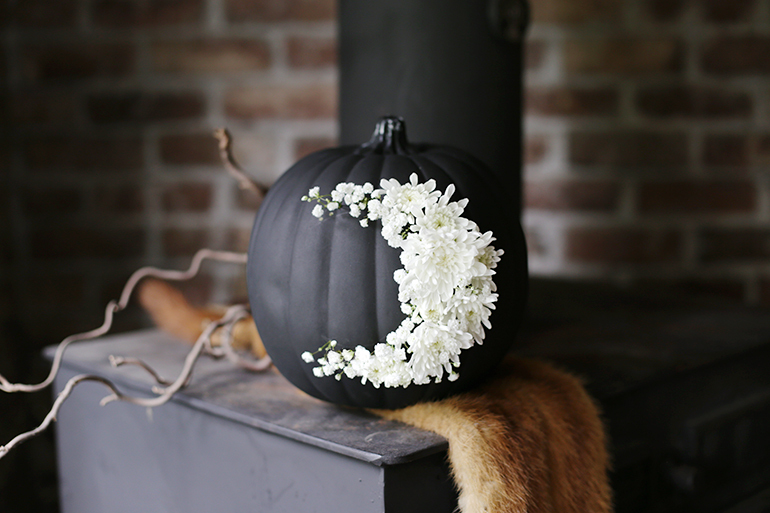 You need a white pumpkin for this DIY. 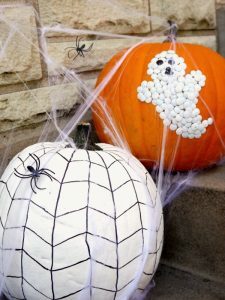 For the mouth, nose and the eyes, you need to stick black duct tape onto wax paper, cut out the shapes, peel off the wax paper and stick them on. 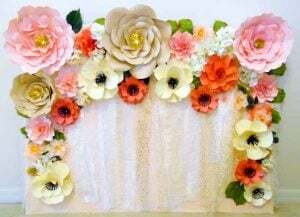 You can use round 1-inch to ½-inch office stickers to make decorative borders and flower shapes. 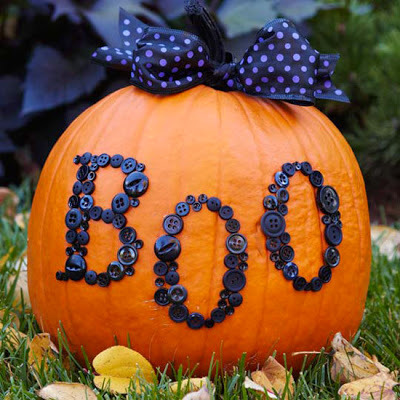 If you want your pumpkin to look realistic, you can cut out the eyes and mouth of a human face from a magazine or newspaper and glue them to the pumpkin. 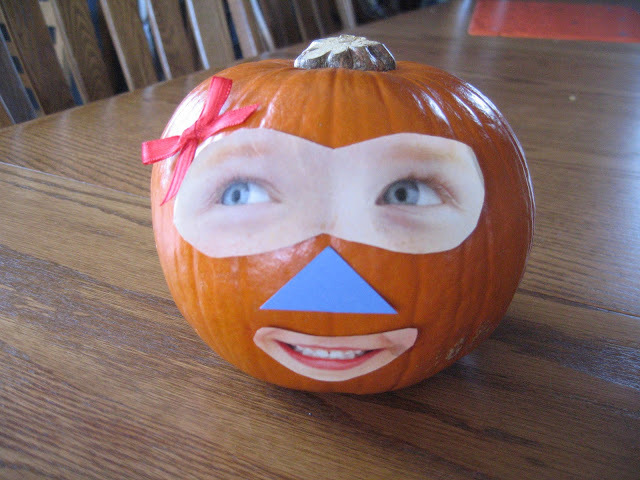 Cut out a triangle from scrapbook paper and glue it in the place of the nose. 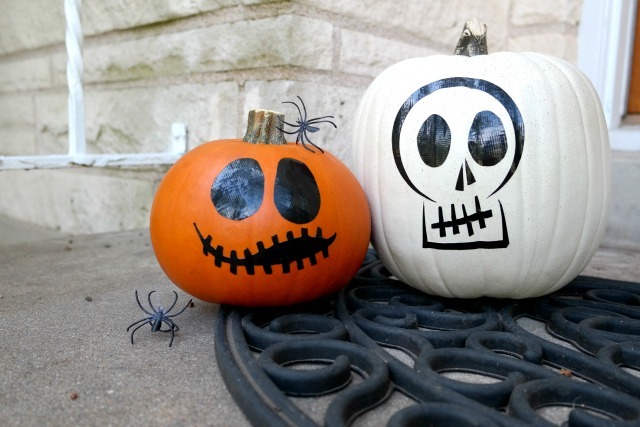 You can give your pumpkins a creepy look by painting them gold and sticking black bows along their sides. 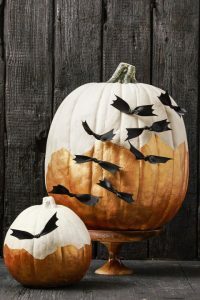 You will find that no-carve pumpkins allow you to keep the decorations for a longer time as the fruits don’t rot that easily as compared to the carved versions. 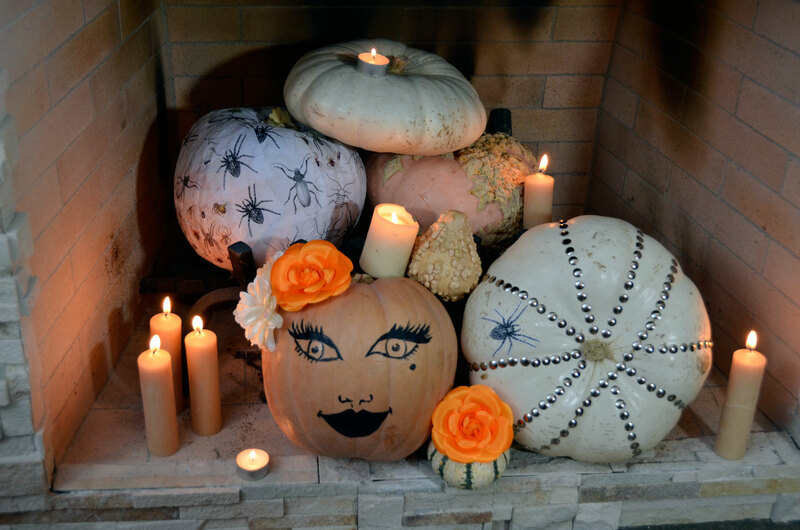 Kids and those who find it hard to carve would be happy to find so many ways of designing pumpkins in one place. 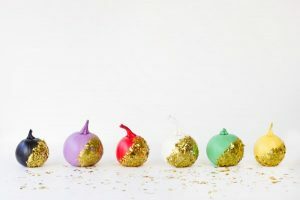 So go ahead, and try them out.